AT THE QUEBEC/ONTARIO BORDER — Tensions were high in the car. Melani’s Google Maps app wouldn’t let her choose the path less taken and she was growing more frustrated by the moment. We had just filled up with gas and coffee and donuts. Katy Perry was roaring out of the speakers in the front and the little girl in the back. There was a bagel to be split and Trevor was saying something in defence of drive-thrus in response to my declaration that that one — which had been trying — would be our last. So I missed a turn. It’s not just that I couldn’t hear anything — it was that Melani’s phone was navigating and I couldn’t refer to the screen as a backup — she was using it for internet things. What followed was several minutes of very polite, toneless conversation, at the end of which neither the GPS nor the phone would cooperate. The Tom-Tom, long our trusted sidekick and fellow adventurer, had begun to betray us last year. Rather than a series of cool adventures sparked by a GPS glitch or prank, we were suddenly unable to update our “lifetime of maps” and were more and more often detoured in great curlicues of frustration when a straight line would have sufficed. Besides, “lifetime maps” cannot possibly determine a half-decent route during the Turcot project anyway. My phone, which syncs via Bluetooth and for which I have a cradle so I can see the map, is paid for by my company, so I don’t use data when I don’t have to. That leaves Melani’s phone, and since she’s the default navigator, it makes sense, right? Right? Nearly there, the phone chimed in, “I’ve found another route that is 11 minutes faster.” It indicated that it was going to switch without permission and Melani said some choice words — we are allowed to say these words in the car — and denied it control. NOT LIABLE FOR ANY DAMAGE! The name “Abitibi-Consolidated” was partially obscured. Abitibi-Consolidated is the world’s largest newsprint producer, launched by William Price Sr. in the 1800s and taken over by this sons. Meanwhile, Abitibi Pulp and Paper Co. Ltd. was created in 1912 by Frank Harris Anson. In its heyday, Abitibi built mills throughout Ontario and towns sprouted up around them, many of which remain even though pulp’s prime is long past. Through mergers and acquisitions, the Price name was hyphenated in until Montreal-based Abitibi-Price became Consolidated in 1997. Newsprint might not be the gargantuan it once was (hey, you should subscribe to your local paper, by the way), but logging is alive and well in northern Quebec and Ontario. “How long is this road?” I asked. I nodded gravely and the tires spit small rocks as we rocketed ahead. It was a hot Sunday afternoon. There were no logging trucks; we would only encounter three or four other drivers in the next hour — all of them going the other way. Still, it was more than 10 minutes before the phone gave up and realized it had lost. 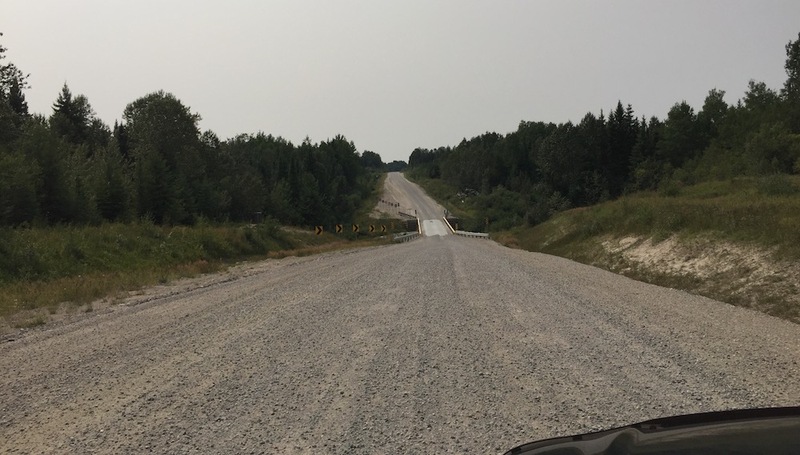 Crossover, we shortly learned, was another 20 kilometres of even-more-loose gravel and was a smidge wider than an eighteen-wheeler. “I really hope it’s one way,” Melani said. With the windows down and Imagine Dragons blasting, we owned that road for a half-hour or more, blinded by dust and unmoved by the TINK TINK of rock against metal. We fishtailed once on loose rock but otherwise weathered the ups and downs and curing arounds until Crossover gave onto a wide gravel boulevard again — our last 20 kilometres or so. By now my hands were stiff and biceps sore from the constant shaking and shimmying. Still, when we hit pavement at last, we paused regretfully in the sudden silence.